"the WorldMusic.co.uk Highlight of Womad 2012! " The performance of The Manganiyar Seduction was, by far and away, the WorldMusic.co.uk Highlight of Womad 2012! 37 Rajasthani musicians stacked four storeys high in rows of nine in a specially built series of lit-up boxes. Simple idea, complex music, stunning execution. "Simple idea, complex music, stunning execution." The Manganiyars are a hereditary class of Sufi Muslim musicians from the Thar Desert of Rajasthan that borders India and Pakistan. For centuries they have made a living performing for the royal palaces and wealthy patrons of that area, earning great renown for their consummate musicianship and vocals, skilful songwriting and their legendarily intense performances at ceremonies, weddings, parties and celebrations. Their role in that society is rather similar to that of the djelis or griots of West Africa. Unlike them though, they have remained largely unknown outside of Rajasthan, let alone India, until relatively recently. The Manganiyar Seduction is essentially a musical performance of a single piece about one and a quarter hours long, but with a distinctly theatrical vision courtesy of its Director, Royston Abel. He wanted to design a show that would be visually exciting and also show off each of the musicians in turn as they joined in or soloed, as well as highlight the different interactions between them as the piece unfolds. 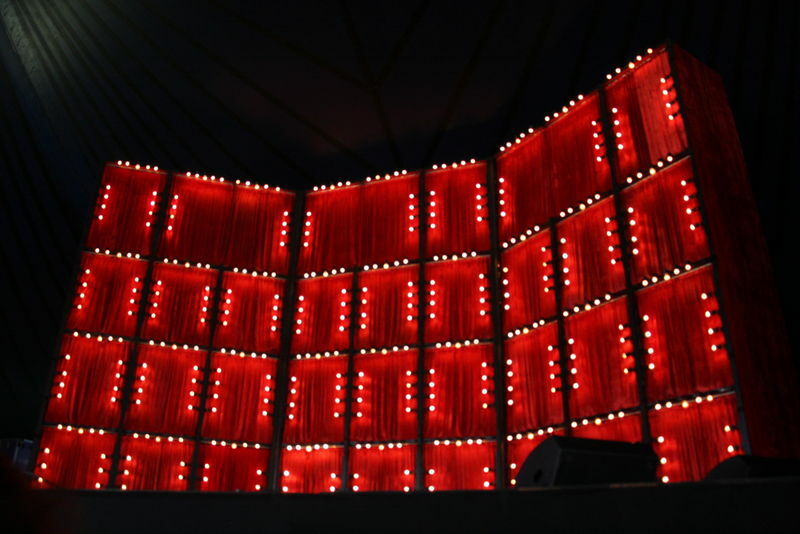 Hence the 3 dimensional, vertical staging: 2,500 kilos of solid wood and metal scaffolding and platform draped in vivid red curtains and electric light bulbs, that takes 8 people 6 hours to put up and is 40 foot by 25 foot in size. 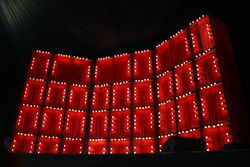 The idea is that as each new instrument or musician enters the piece or takes a solo or major part in the tune, the curtain hiding their box is pushed back and they are lit up by the rectangle of light bulbs demarcating their window. The lights are dimmed when not playing or only providing background support. It’s such a simple idea yet looks fabulous and really concentrates the senses of the audience. In fact the Director Royston Abel has openly stated that he got the idea after seeing the famous window boxes of the Red Light district of Amsterdam! The imagery of this has certain parallels also with the Hawa Mahal, the spectacular Palace of the Breezes in Jaipur, with its facade of 953 jarokhas or little windows (although there the idea was to hide the palace women from sight whilst simultaneously allowing them to see onto the street - the opposite of the Amsterdam experience). "drawn to the light ... leading ultimately to the seduction of the soul"
Not only does it work visually, it also feeds into the whole concept of the Seduction. We are shown the wares on offer and seduced into it, drawn to the light, but instead of fleshly paradise we step into something far more fulfilling, the stimulation of all the senses leading ultimately to the seduction of the soul. This is a very powerful experience. The lit-up windows with the large light bulbs round also reminded me of the traditional make-up mirrors of a theatrical dressing room, the illusion of smoke and mirrors, yet when we look into these ‘mirrors’ we don’t see grease-painted faces staring back, but individual aspects of the divine light. Am I going too far ahead here? Hmmm. Let’s see. There are many interesting parallels and juxtapositions going on in The Manganiyar Seduction, many seeming contradictions. The imagery of vice used to support the presentation of purity, the eternal search for truth and the divine assisted by the ‘magic’ of illusion and concealment, Muslim musicians that sing praise songs to Sufi saints and Hindu goddesses, folk traditions offered up to urban audiences. There’s a lot going on behind what you see and hear. "75 minutes of Sufiana passion that builds to an ecstatic climax…"
Abel explains that he first worked with a handful of Manganiyars some years before and they set about deliberately seducing him with their music: constantly taking and making opportunities to introduce him to their culture, even down to sitting outside his door in the early morning so that he woke up to their songs and serenading him outside his window at night until he was utterly bewitched! He made up his mind to create a show that brought this experience, this seduction, to the world. Abel auditioned around one thousand different Manganiyar musicians and singers before finding the 40 or so that fitted his criteria for the show. "a sinuous river of sound." The 37 musicians at Womad sit mostly cross-legged in individual boxes only able to see the musician to either side and the exuberant conductor running around on the stage in front and below them. It is an exercise in concentration and self-control, surrendering themselves to the whole. I shall describe the different instruments below but they are all traditional North Indian ones, often distinctly Rajasthani and in some cases exclusively Manganiyar. The music itself is, I think, based on three separate pieces, but the whole is completely interwoven, with no obvious breaks, so that it flows seamlessly between differing solos, duos, trios and ultimately up to the full complement of the entire party in a sinuous river of sound. As we looked up to the towering structure all we could see were rectangles of dim lightbulbs framing each red-curtained window. And then it started, two curtains were pushed back and a set of bulbs lit up on one of the windows on the lowest level to reveal a cross-legged musician dressed in white with a multi-coloured turban and sporting an impressive thick black moustache and behind that some equally impressive front teeth. This was Dharen Khan and he was filling the air with the peculiar drone of the Manganiyar’s most iconic instrument the kamancha (aka kamaycha) a fiddle made and played exclusively by their community. It has a rounded body with an unfretted straight neck, all carved from a single piece of mango wood. The resonance chamber is covered with tight goatskin and the three principal gut strings are played with a horsehair bow. Another 20 metal strings are tuned to resonate in sympathy when certain notes are bowed on the three gut strings. A great round of applause greeted his appearance and it was to be a defining feature of this particular show that as every new curtain was pushed back and lit up the Womad audience would loudly cheer and applaud in anticipation of new aural delights. And so it was when the second window was revealed and lit up - the central box in the second level up - and we saw and heard Mame Khan, the principal singer, also robed in white with a multi-coloured turban and a smaller but nevertheless very fine moustache. Mame’s soaring voice rose above the drone of Dharen’s fundamental note and the two leisurely called to us, Mame gesticulating with upstretched arms, punctuating his vocals with hand and head movements, inviting us into their world, like mythical sirens heard from afar on the bone-dry rolling oceans of the Thar Desert. The seduction had begun. Quite suddenly, amidst huge cheers, the conductor, Daevo Khan, rushes onto the stage, bareheaded and dressed neck-to-toe in white, khartaals in either hand (Rajasthani khartaals are pairs of thin teak wood, played rhythmically rather similar to our own folkloric ‘bones’). With his back to us he gestures to the right and another 6 singers pull back their curtains and start to sing, and then to left and 4 drummers light up, sitting down with dholak drums on their laps. The dholak is a cylindrical wooden drum with tapered ends either side made from dark, heavy wood. It’s played horizontally on the lap by the hands, one end (usually the right) being of higher pitch and the other about a fourth or fifth lower. My ears start to listen more intently to the drumming and yet I am confused. I thought I could hear a tabla, or more specifically the bayan (the lower-pitched drum of the tabla pairing). I kept straining my neck and eyes looking for one but nothing. It took me ages to realise that the pitch-bending pulses were coming from the drummer’s left hand on the lower-pitched skin of their dholaks and not from a completely separate drum. And then three more kamancha fiddles join in and then yet three more! From the slow and delicate spatial beginning there is now a thick, dense texture of skin, gut and vocal musics wrapping around us and drawing us ever in. Wonderful. I’m afloat, buoyed up on a tide of sound and imagery. However, this dense sonic tapestry fades back to just a single kamancha and a dholak and these two are then engaged in a jugalbandi (a musical sparring of virtuosic equals) that was just exhilarating! This leads into a drone again and the solo performance of what I assume is the oldest of the singers, a distinguished looking gentleman with a very smart white moustache. Others singers join in and take over and the melodic and rhythmic interplay goes back and forth between the singers and drummers as the slow vocal section morphs into a fast rhythm. This all goes on for quite a time until all of a sudden, there’s a movement in the upper right section of the fourth tier and a big bass drum booms out, played by a standing drummer wielding a thick beater, the 3 singers of the bottom level now all singing together in unison to the emphatic boom of the bass drum. Then the 7 singers of the second level take over accompanying the big drum; then the bottom 3 join in - so there are now 10 singers all with full, open-throated vocals crying out, arms rising and falling with the intensity of their voices. Another two windows open on the left of the 2nd level section and we see two men playing the most difficult of all Indian instruments, the sarangi. In some ways the sarangi is similar to the kamancha - it’s a bowed fiddle carved from a single piece of wood, yet the sarangi is even more complex with up to 40 strings (both bowed and complementary) and is usually considered to be the nearest one to the subtleties and intricacies of the human voice. Its name means “a hundred colours”. The sarangi players form a trio with the dholak drummer and yet another musical facet of Rajasthani culture is revealed and explored. "competing to raise the levels of musical intoxication." But wait, there is yet more madness as the whole ensemble join in (or at least those already unveiled). Throughout the performance there is a constant shifting of pace and pulse, of texture, of tone, of pitch and rhythm. Restless and relentless, sometimes delicate and fey, other times bold and rollicking. And then three more windows open on the third level up to reveal 3 more singers and the sound thickens agains and begins to drug our senses. The tempo and rhythms are motoring along now with dholaks and sarangi pushing ahead as the singers take turns to outdo each other, not just between individual singers but even between different groups of boxes on the four tiers. It’s as if they are competing to raise the levels of musical intoxication. With 13 singers chorusing away (many who can’t see each other due to the deliberate staging), the conductor has to really use his khartaals to maintain timing and rhythm. For such small instruments their 'click-clack' cuts right through and rivets everything together. A new window on the top level opens and is lit up and we see a young man playing a morchang - a jaw harp! These morchangs are much larger than the Jaw Harps (aka Jews Harps) we’re used to seeing over here and are made specifically by the Manganiyar blacksmiths. "furiously bending his bass notes in a mind-wobbling pulse." He’s accompanied by a dholak, and a flautist until they enter into just a flute and drum duet, with the the drummer furiously bending his bass notes in a mind-wobbling pulse. A whole series of intense solos and duets follow, each showcasing the respective skills of the musicians - true jugalbandi style. It starts with Daevo Khan’s khartaals versus the morchang which leads into a virtuosic khartaal solo played directly to the audience: Daevo in the middle of the stage spotlighted in the blackness with perspiration pouring off him each time he shakes his head in emphasis to the rhythms he’s creating and a huge engaging grin on his face. He even manages to get the whole Siam Tent involved in a mass call-and-response section with him. Very impressive. Some real skills. The morchang takes over and pits itself against the dholak and khartaals. He manages to achieve a curious rumble and buzz with just his mouth and tongue that sounds like he’s plugged into a fuzzbox - his amazing vibrato produces this heavily distorted sound and combined with some really fast and furious tongue and finger work his solo just builds and builds, ending on a skin-tingling tihai (the thrice-repeated phrase that signifies the end of a section or piece). However, as with all this performance there is no break in the music, we are hit straightaway with yet another sonic ingredient. Two more windows have opened to reveal two flautists playing instruments that sound just like bagpipes! Wonderment from audience! Bagpipes? Really? I couldn’t tell if they were the mashak (North Indian bagpipes) or alghoza (the double piped flutes of the Manganiyar) - I’m at the limits of my musical knowledge here and I certainly couldn’t get a decent sightline on them. Still, what a contrast! (*on closer inspection of this blown up photo I took, it looks more like the 'been', ie the so-called snake-charmers' flute - notice the fat middle section, single mouthpiece and slight curvature. I'm willing to be corrected though by anyone that knows! GP). And then, the young man who previously played the morchang (jaw harp) is lit up and now he’s playing a bhopang! It’s a small underarm plucked instrument that looks halfway between two back-to-back coconuts and a cheesewire! In fact it’s an hourglass shaped drum with a skin on one end, yet it’s not beaten because there is a metal wire passed through the centre of the skin and tied underneath, with the top end wrapped around a short stick; the wire is then stretched vertically and pulled tight by the hand whilst the string is plucked with a long thin plectrum and the notes are bent by pulling and relaxing the wire. Needless to say, he then solos on this accompanied by the opening of yet another window (this time a large one to the right where we see seated, three more men all playing khartaals. The sounds of ‘clickety-click’ and ‘boing-boing-boing’ driven at a furious pace never sounded so musical! How on earth do any of them keep up? The music then take a pause as it enters into a slow section and a new double window opens up with two men strumming what seem to be tall stringed instruments. I’m guessing they are tampuras, the original stringed drones of North India. The musicians sing at the same time - just the two of them before being joined by all the singers in a slow stately passage of great beauty, with the accompaniment of the dholak, sarangi, kamancha, khartaals, etc. Gradually it picks up speed but then one singer takes the lead and it becomes a call-and-response section between him and the chorus of all the others. The curtains of the penultimate window in the top left hand corner twitch and then are pulled apart and the box is lit up: it’s another bass drummer. The singing stops and he thunders in accompanied by his bass drum counterpart on the other corner - now it’s just the two of them, building and building. Hard, heavy, hitting the spot, no stopping now. There is only one window left to reveal, right in the centre of the top level. There is a sense of great expectation and anticipation to know who or what is behind that final curtain… So many surprises so far. Just what might there be? And then there it is! ...and then it all slows down, and down… and enters a steady groove… then gets slower still, and slower again, as our heartbeats readjust and we teeter on the brink. They’re playing with us now. "no-one will forget these amazing musicians, this unique show, this incredible experience"
Trust me, no-one will forget these amazing musicians, this unique show, this incredible experience ever. The ovation went on for ages. The Director, Royston Abel, was unable to speak for a considerable time, people just wanted to clap and clap and clap and even that became an inadequate form of expression. Eventually Abel managed to get himself heard over the applause and explained about the show, the difficulties in getting visas for 40 Muslim musicians all named Khan and much more. The musicians sat in their boxes and applauded us back, hands raised above their heads. I know they’ve been performing this for a few years now and have travelled all over the world with it, to many prestigious stages and venues and festivals, but surely they can’t have heard anything like the roar that hit them back as we realised we’d heard the last note? The last note? Well, technically no. We were treated to an encore, a short 5 minute piece that - as Abel explained - was a hymn to Krishna the Hindu God,“the Casanova of Indian Mythology”. Now, you might say: “but I thought you said they were Muslims?”. Yes, but the Manganiyars respect religious devotion and practice a form of duality that honours both the Muslim saints and Hindu goddesses whilst recognising a supreme god (to the best of my understanding, that is). So, we bathed in the afterglow of The Manganiyar Seduction whilst they delivered a slow, calming hymn where all the musicians sang accompanied by just a single dholak drum and two kamanchas, each singer finishing their verses and closing their curtains until all that was left were the three musicians. The notes faded away. The lights dimmed and went out. We had been utterly seduced . . . Nothing, but nothing, could compete with that for sheer intensity, artistry and impact. As I said at the top, by far and away, the highlight of Womad 2012.